After pause of a couple of weeks when a last-minute hitch held up deployment, the latest Marketplace update rolled out during week #41, with the Lab blogging about it on Wednesday, October 10th, 2018. It’s an update that sees a trio of new features added to the MP, all of which have been the subject of numerous requests – wish lists and favourites / follows. The update also includes a number of bug fixes. Add items you’re not ready to buy to your personal wish list. Make purchases from your wish list. Share your wish list with friends (so they can buy you rez day gifts, etc.). Add favourite items to a personal list for easy relocation. Make purchases from your list. Add favourite products to your wish list. Add favourite stores to your list (use them to check on new releases more easily). View one of your favourite stores from the list. Individual items are added to your wish list / favourites list by viewing them in the Marketplace and then click on the Add to Wishlist or Add to Favourites options, located on the right of the item display. To add a store to your favourites, open the store’s main page in the Marketplace, and click the Add To Favourite Stores option on the left of the store’s main page. You can view your favourites whilst on the Marketplace by clicking on your account name (top right) to go to your account page, then clicking the My Favourites drop-down, which will display the options: Products (favourites), Stores, Wishlist. The Products page will open by default, but may be blank if you have not selected any favourites. You can access your lists from your Marketplace account page : click your account name at the top (arrowed) then click the My Favourites drop-down (circled, left). This will display the list options and open your Products (favourites) page (shown). Note the Add To Wishlist button, arrowed at the bottom. 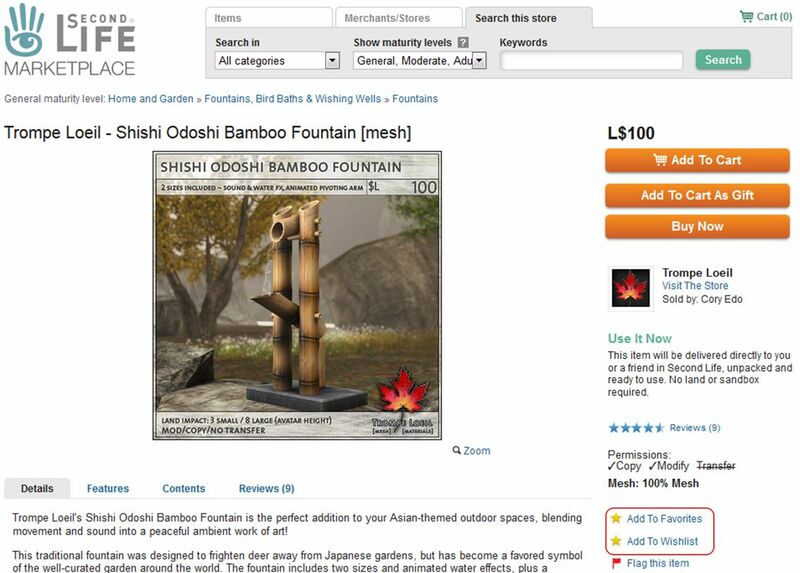 Clicking on an item in the Product or Wishlist pages will take you to the Marketplace listing for that item. Stores in the stores list will be displayed with up to four of their most recent releases. Clicking on a store in the Stores page will (unsurprisingly) take you to the store. 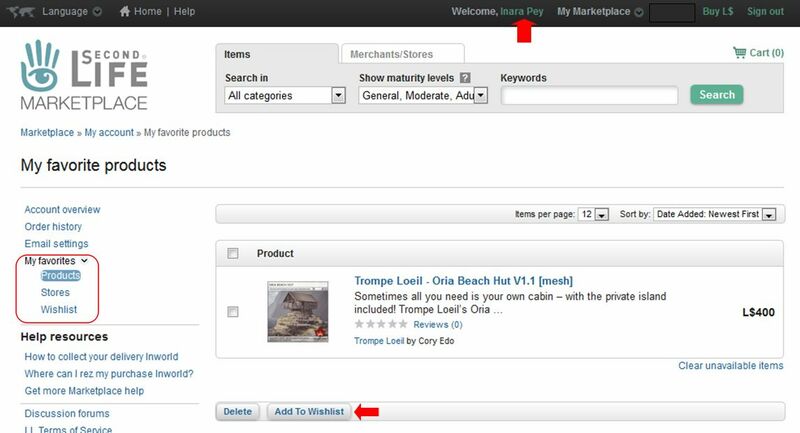 Listed items / stores can be removed individually or in bulk by clicking on the check box on the left of an item / store and then clicking the delete button. Favourite items can be added to your wish list via the Add To Wishlist button on the Product page. Click the View and Share Wishlist link at the end of your wish list page. This opens a fresh page displaying your wish list. Copy the URL in the browser (e.g. https://marketplace.secondlife.com/wishlists/avatar.name) and pass to friends. Note you must have an active log-in session with the Marketplace for these links to work. On Tuesday, October 9th, Linden Lab issues the October release for Sansar (R26). Called the thumbs-up release, it includes some significant updates and additions, not all of which I can review in-depth, simply because they are VR-oriented. However, the VR such is not perhaps the most significant element within the release – although it is impressive. The full release notes for R26 are available here. This is perhaps the most anticipated element within the release. With it, content creators can now set permissions against their goods, allowing them to be sold and re-sold via the Sansar Store. 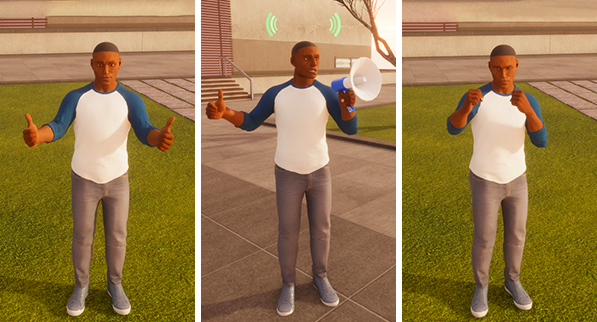 Sansar’s permissions system is built around the concept of the supply chain: creators can sell complete items “as is”, or they can create items – such as components as well as complete objects like a house or a suite of furniture, etc.,), expressly for other creators to use in their own creations which can also be sold on to consumers, with both the maker of the object and the creator of the original item receive payment. The Resale Price: set by the original creator, it defines the price at which the item must be resold and is their commission on any re-sales of that item / any objects in which it is used. So using the car engine / gearbox example, if the resale price for these is set at S$400, then anyone building a car using them must factor this amount into their car price, as the engine / gearbox creator will receive S$400 from the sale of each car using the engine / gearbox. The Buyers Permissions: set by the creator of an object sold via the Store, these define what purchasers can change with the object when they have bought it. 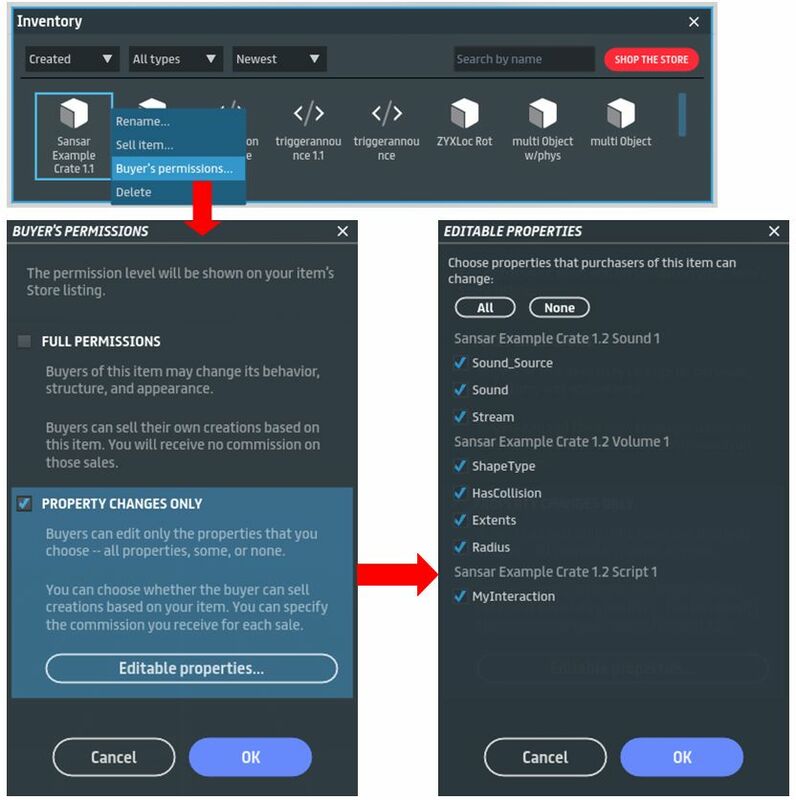 Creators can now set permissions on the elements in their objects purchasers can change, or they can opt to offer then with full permissions. Credit: Linden Lab. There are some important concepts around resale prices and buyer’s permissions, so please read the official documents linked to above – particularly the small print. Save to Inventory: Objects with edited properties or with additional components can now be saved from a scene in Edit mode back to inventory. With this release, it is still not possible to join two objects together. Note: Legacy items created by other store sellers cannot be saved back to the inventory. Licensing: Any item uploaded to Sansar or saved back to inventory will not contain a basic license with information of the avatar uploading / saving it. This is part of the mechanism to allow items to be resold and commissions paid. Disable materials editing: it is no longer possible to change the materials of legacy items purchased prior to this release. For new items, materials editing can be enabled by giving full editing permissions or limit it by setting it to property changes only. With the September 2018 R25 release, Linden Lab took the first step towards integrating the Sansar Store into the client. At that time, users could browse the store from within the client, but when wishing to purchase an item would be transferred to the web version of the Store in their browser to complete their purchase. 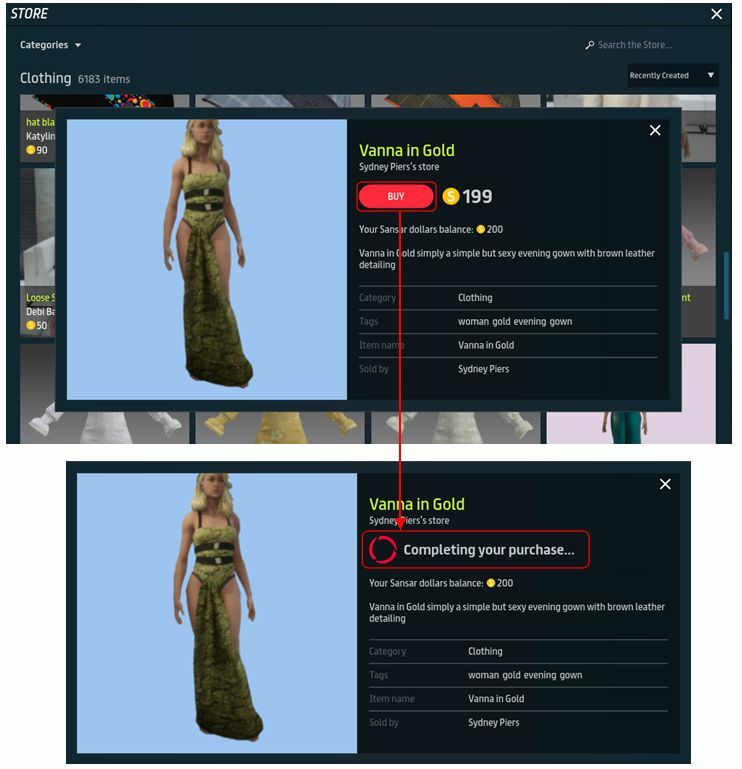 With this release, purchases can now be completed within the client.